What is it? A short, story-driven adventure game with environmental puzzles. It’s amazing how well a grief-racked sob carries across the uncanny valley. 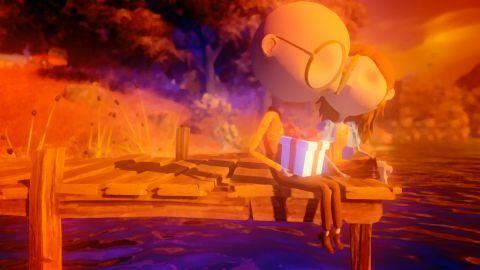 Even with creepy, eyeless characters Last Day of June tells a bite-sized story about love, lovers, loved ones, and losing them. It stars Carl and June, a young couple in a small seaside village. An accident leaves Carl a widower, but rather than accepting fate, he resolves to revisit every angle of June’s last day not only to understand what took her but, maybe, bring her back. It’s a short, sad, and sweet game that I dearly wish was more fun to play. I was immediately surprised by how endearing the strange characters are. They have huge round heads and only concave pits for eyes, which are especially strange alongside their spindly limbs. Along with the gibberish they speak, it makes for an emotive cast. I won’t spoil exactly what it deals with, but Last Day of June does deal with some heavy stuff, and characters act with humanity and levity. The gorgeous world contrasts with the tragedy of the story and immediately drew me in. There’s a handcrafted look to it, all vibrant colors and vivid lighting rendered in deliberate, textural brush strokes. There’s also a shallow field of view, as if the camera is locked to a wide aperture. The background blurs as the foreground pops, everything dripping like a post-impressionist painting. The painterly visuals are no coincidence, either. A previous tragedy drove June to seek comfort in her paintings, which Carl must now use to revisit the past. There are four central paintings—one for each supporting character. As the truth of June’s last day comes to light, you slip into the shoes of a young boy, an old man, a wistful woman, and an eccentric hunter, and their histories echo the central theme of loss in different ways. By shifting the boy from his ball to his kite, I allow a new disaster involving the woman to creep in, so I’ve got to prevent that now too. Each painting is essentially an environmental puzzle, a reenactment of that character’s actions on June’s last day. It’s made clear how each connects to June’s death, but it falls to you to reorder events in a way that prevents it. For instance, the young boy winds up in the middle of the road playing with his ball, causing Carl to swerve to avoid him and ultimately crash his car. How do I keep the boy out of the road? I’ve got to keep him from playing with the ball, but I can’t just tie him to a tree. Instead, I enter his painting and coax him into playing with his kite—safely away from the road. Putting the right person in the wrong place can make all the difference in the world. Puzzles start off simple but deepen as I visit more and more paintings. There’s a fascinating ripple effect at work. My choices in one painting preclude options in another, forcing me to redo the entire chain of events. By shifting the boy from his ball to his kite, I allow a new disaster involving the woman to creep in, so I’ve got to prevent that now too. It’s a clever blend of problem-solving and storytelling, but it doesn’t age well over the modest two- to three-hour runtime. Unfortunately Last Day of June gets worse the more you play it. Rather, the more you replay it, backtracking to adjust events you've already seen. The magic of the visuals and the novelty of the head-hopping wore off well before I reached the ending. Puzzles are inoffensive at best but contrived busywork at worst. It never reaches the ‘try everything with everything’ mindlessness of some adventure games, but idly moving boxes, knocking over pots or chasing birds around the village gets old quickly. It’s cool to see how characters connect to the accident, but their actions leading up to it are universally dull. Worse are the unskippable cutscenes. I can’t tell you how many times I was forced to sit through the same sequences. You have to rearrange and rewatch events frequently due to the nature of the story, and while some events are mercifully shortened as you progress, repetition is still guaranteed and almost nothing can be skipped. Tragedy and repetition just don’t get along, and I was bored with even the most climactic moments the umpteenth time through. It reinforces the futility of Carl’s quest, but it isn’t particularly fun. The theme of not getting what you want serves its story better than its puzzles, but I’ll definitely remember Last Day of June, and not just for its stunning art. A brief string of memories accompanies each new painting, and there was one around the halfway point that really got to me. It confirmed a suspicion I’d had since the first few minutes of the game—a suspicion based on two seconds of animation from what is essentially a stick figure. Getting me invested in a big-headed stick figure in five minutes is testament to Last Day of June’s rich atmosphere and achingly human narrative. It’s hard to recommend a game that is only fun to play half of the time, but the story and poignant ending are engrossing enough to carry the experience.